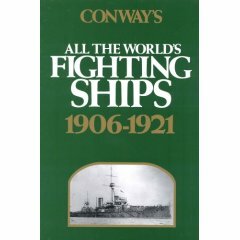 Conway’s All the World’s Fighting Ships: 1906-1921 is also one of my most used and viewed reference works at the moment (along with the other Conway’s and The China Steam Navy reviewed elsewhere). Conway’s is the most complete reference on ships from the end of the pre-Dreadnought period to the end of the First World War. Vessels in service with all navies over the time period are covered. Better than the Janes publications, Conway’s draws on many sources to provide information on all vessels in service in the time period from the Great Powers (Great Britain, USA, Germany, Russia, Japan, Austria-Hungary, France and Italy); Coast Defence Navies (Sweden, Denmark, Norway, The Netherlands, Portugal, Spain, Greece, Turkey, China, Argentina, Brazil, Chile and Peru); and the Minor Navies (Belgium, Bulgaria, Cambodia, Columbia, Costa Rica, Cuba, Dominican Republic, Ecuador, Egypt, Estonia, Finland, Haiti, Honduras, Latvia, Liberia, Mexico, Morocco, Nicaragua, Paraguay, Persia, Poland, Rumania, San Salvador, Sarawak, Siam, Uruguay, Venezuela, Yugoslavia and Zanzibar). What a great list. The book covers the vessels in service over that time period, providing details of the vessel and in many cases, a line drawing or contemporary photograph of the vessel or class member. Further background information is provided on each of the fleets being discussed as well as some discussion on the organisation or fleet strength of each nation. Each country section is further divided between Capital Ships (both pre-Dreadnoughts and Dreadnoughts), Monitors, Cruisers, Aircraft Carriers, Gunboats, Torpedo Boats, Destroyers, Submarines and other types of vessels. This nation, which shares the great island of Hispaniola with Haiti, maintained a small gunboat navy during this era. In May 1916 the United States intervened in a civil war and a brigade of US Marines were stationed on the island until September 1924. There were enough skirmishers by mid-1918 to yield 53,000 firearms. The following minor warships composed the Dominican Navy during this era: Restaurcion (guboat, launched 1896, 1000t, 4-4.7in, stricken c1916); Presidente (gunboat, rebuilt 1898, 4 small guns, stricken c1916). Not only details of the vessels, but the vessels end is also briefly covered, whether the vessel was stricken, lost in battle, broken up and so on. This period was where the battleship ruled the seas – well before the threat of aircraft made the aircraft carrier the queen of the fleet. This was also a transition period from the old coal burning warships with their attendant great plumes of black smoke and the need to coal ships, usually involving the entire crew for the best part of a day to oil. There are some great photos in this book and it is well worth the cost. There are three companion volumes covering earlier and later periods and together they make a wonderful reference set. This book should be on the bookshelf of anyone with an interest in early 20th century naval warfare. I can thoroughly recommend this book.